January always does something to me … do you feel the same way? It’s in January – although it is the dead of winter that something within me actually re-ignites. While everything else is hibernating … I’m re-energized. While everything else lays dormant … I’m growing like that infamous weed. Your winter might look different than my winter … but the fire is there just the same. While the air is frigid and the days are short – there is an eternal summer in my soul. I am ready for new assignments … for fresh vision … and for untapped opportunities. I think perhaps that I have re-programmed myself for this uncommon feeling that is mine – all mine - in January. Honestly, I spent so many of my January’s in the deep, dark of depression that I have retrained my mind and my heart to breeze through January rather than slog through it. I have decided to sprint through January rather than plow through it. I have come to expect sunshine rather than gloom and joy rather than discouragement. I decided to change “me” and to then see what would happen to my January. I decided to think differently … and to anticipate differently … and to process differently. I have re-set my mind and my heart to take on whatever blizzard January might offer. 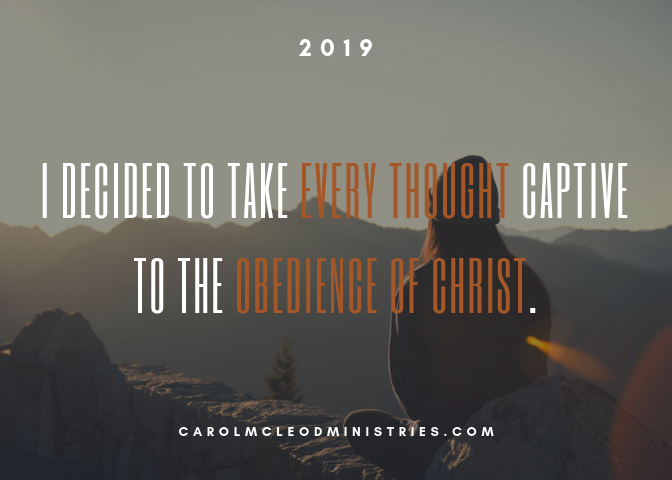 I guess that I decided to take every thought captive to the obedience of Christ. I guess that I decided to guard my heart above all else. And the change has been enormous. … the change in me has been nothing short of miraculous. So … would you allow me to be your January coach? Could I help you through some of the icy, frozen days of your soul? First of all … think differently. Don’t expect the worse … expect the best! For every negative thought that comes into your mind – replace it with a powerful Scripture verse. This is not the power of positive thinking … this is the power of powerful thinking! Don’t allow the icebergs of discouragement or despondency to grow in the cold caverns of your mind … melt them with the warmth of God’s Word! My second coaching tip for you is to re-evaluate the feelings that are growing in like icicles in your heart. I have learned that it is much easier and more efficient to bring a gloomy feeling in from the cold when it is small rather than when it has grown to an unmanageable size. When I began to feel the seeds of depression germinate in my January heart, I rapidly pulled them out and replace them with a healthier emotion. You might wonder … how do you do that? Well … I proactively encourage someone else. I send a sweet e-mail … or buy some flowers for my neighbor … or call an old friend on the phone to let them know that I appreciate them. Rather than focusing on my sadness … I try to set my gaze on the extraordinary opportunity to bring joy and gladness to someone else’s life. When I lay my head on the pillow at night … I can look back at my day and be thankful that God used me as a source of joy in someone else’s life. Rather than having a dread come upon me as I wake up in the morning … I am filled with anticipation about how the Lord will use me that day. It’s January! What a great month to take every thought captive … to guard your heart … to think power thoughts … and to scatter joy everywhere you go! I’m in … are you?